God, religion, and Jordan Smith on The Voice. The Messiah has arrived, and he’s on the increasingly religious reality singing show The Voice. 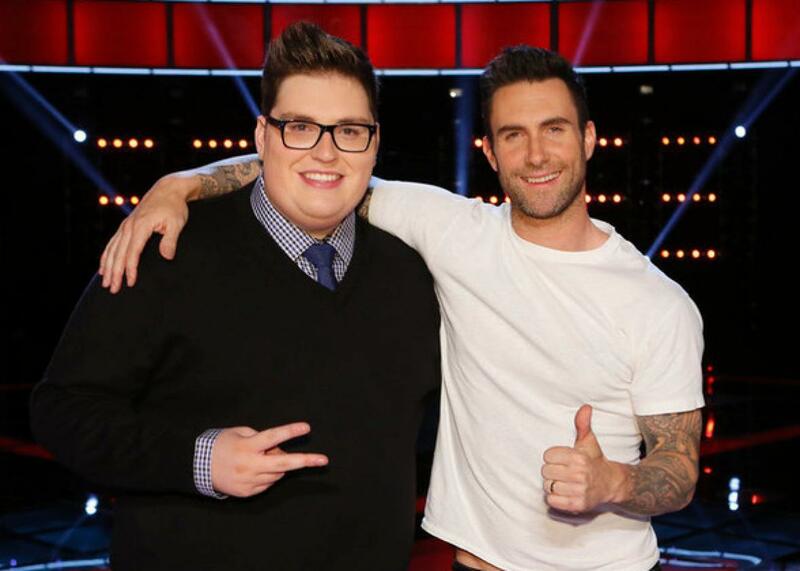 Jordan Smith and Adam Levine on The Voice. The Voice’s two-part season finale begins Monday night, but if you’ve been watching, you already know who’s won. Jordan Smith, dubbed “the unicorn,” is a phenomenon, possessing (or possessed by) a voice that is at once totally controlled and seemingly unimpeded by normal, human bounds. Genderless and expansive, this voice is as ambiguous as it is precise, quickly scaling and spelunking through octaves, never anything but perfectly on pitch. The show’s traditional “chair turn” revealed to the judges that Smith—a 21-year-old who hails from Harlan, Kentucky and attends an evangelical college in Tennessee—is sort of regular-looking: pale and doughy, a bit hunched, wearing glasses that contract his eyes into wet-looking seeds. When Voice coach Gwen Stefani saw Jordan Smith for the first time, she whipped her leg over her head like a freakishly yogic mime telegraphing surprise, then ran at him with her arms spread out for a hug. “You do not look like your voice, FYI,” she told him. The Voice is no stranger to religious messaging, starting with its title. Many of its contestants profess to having developed their instruments singing in their church choirs, like so many Americans. And there’s the fact that contestants remain on the show by “being saved.” (By the time the show hits its live rounds, each week an increasingly scant group is “saved by America,” like some kind of slow-release, Nielsen-rated rapture.) Until recently, The Voice seemed to treat religion with caution; in 2013, it riled some Christian viewers by giving a popular hymn a secular makeover, subbing “Lord” with crooner-filler “Oh” and cutting out references to “heaven” and a “savior” entirely. But last season, the bounds loosened, and contestants dialed up appeals to religious constituents. Now, in its ninth season, The Voice is in its own weird way the most religious show in prime time. Coaches will often refer to singers’ virtue, holding them as examples of “what makes this show so pure.” They take note of who brings “a message,” and cast “prayers” for their moving forward in the competition. And the judges’ rapturous descriptions of their singers’ gifts are getting more and more cosmic: “Your voice seems like it’s made of what beautiful clouds are made of,” Pharrell Williams told one contestant recently, “and it seemed like when you sang just now, the stars would come out to assist that moment”—a sentiment with a real stonerish vibe, but also an expression of a universe that is sacred and responsive. But it’s Jordan Smith who brings forth the spirit in the show most often. Smith’s octave-bending version of Beyoncé’s “Halo” prompted Williams to tell the singer: “Literally, it’s totally true that God has signed your voice.” Gwen Stefani jumped in to concur: “All I can think of is God when he sings.” Beginning with that isolation of singers’ voices in the blind auditions, The Voice has always been making an argument about where and how “gifts” are manifest. A vocal competition—something that seems to be about exploring the limits of a wholly human instrument—has morphed into an explicit insistence on the existence of a higher power. When Williams imagines Smith’s voice as God’s John Hancock, he’s fixing talent to faith, proposing that Smith’s art is, itself, evidence of a divine art. But this is, of course, not only about art. Unlike its Biblical namesake, The Voice is not manifest in the dark, does not exist in a vacuum. The second half of the season arrives in real time, and America shows up week after week to “save” contestants. One way to cast a vote for a singer is by downloading his or her song on iTunes (for $1.29). If a contestant’s song makes it to the Top 10 of the iTunes Singles chart (not an uncommon event—the day after the semifinal live performances, Voice contestants made up eight of the slots on that Top 10 chart) that artist receives a bump, multiplying their recorded iTunes votes tenfold. Last week, in the performance that secured his place in The Voice finale, Smith pulled out his first rock ballad with Queen’s “Somebody to Love.” Closing out the song, and the night of performances, Smith scurried up and down a two-octave run before falling to his knees while a full gospel choir performed a laying on of (jazz) hands in the air, enclosing him in his sanctum of song. Within hours, this performance dethroned Adele from the No. 1 spot on iTunes’ Singles list. Could Smith’s seemingly unimpeachable front-runner status be rigged for a dramatic, publicity-generating tumble? Sure. This narrative—the fallen would-be winner, the dark horse who rises up in replacement—is a familiar one, and not exactly new to reality TV. But I don’t think that’s what’s happening on this particular show, in this particular year. That story isn’t what America is hungry for right now. America is searching for a lone voice—singular, pitch-perfect—rising out of contest and cacophony to deliver the light and the truth.